Barcode scanners and barcode terminals are used in a variety of logistical environments, such as retail, offices, warehouses and on the road. The wide demand for barcode scanners is met on the market by a very extensive selection, which can make the decision for the right device difficult. The volume of data to be managed by a scanner can range from occasional scanning to thousands of scans in close sequence. Not every one of the different technologies used in scanners fits every task. That is why manufacturers offer scanner models for various applications. Especially when purchasing a larger number of barcode scanners, for example for mobile employees or a warehouse, we recommend to carefully study the available options before investing in order to make the best purchase decision for your needs. The devices purchased should not only match the expected scope of use and the application environment. Possible interfaces should also be taken into account during the selection process so that the new acquisition can be easily integrated into the existing infrastructure and data structure. If a higher volume of data is expected, the more powerful models should be considered right from the start. Special features such as IP protection classes for water and dust resistance and resistance to drops are also relevant factors that influence the product life cycle and missing equipment due to necessary repairs. In order to detect barcodes at close range and under constant conditions, e.g. at cash registers in retail, cost-effective, cable-based barcode scanner solutions are often sufficient. For mobile data acquisition, wireless barcode scanners are particularly suitable. The available models work with different radio technologies and cover different ranges and different processing modes. The heart of a barcode scanner is the image sensor. The most commonly used sensor technologies CCD, laser and imager have various advantages and disadvantages, which are decisive for which applications the device is best suited for. Imagers (Area Imager / Camera Scanner for Digital Image Capture) are the latest generation and currently the most cost-intensive option of scanning technology. The technology is similar to that of digital cameras. As a result, imagers can also read out two-dimensional bar codes in addition to one-dimensional bar codes. The technology also makes it possible to capture much information at once. Different scan angles are no problem. High-performance area imagers are also suitable for the mobile capturing of documents and, for example, damage photos, and thus particularly for application in transport and in the tracing of goods. The more expensive technology pays for itself, since it enables mobile processing and processing on the road and its use makes the acquisition of additional hardware, such as flatbed scanner and cameras, unnecessary. In the laser scanner, one or more laser beams are guided over the bar code at high speed, and the light and dark areas are optically read out. Laser scanners operate at high speed and have a high tolerance at reading distance, movement, and also partially at the scanning angle. Even under suboptimal light conditions, the data is reliably read. Unfortunately, no 2D barcodes can be acquired with laser scanners. Laser technology is more cost-effective than imagers, and particularly advantageous in environments and situations that require flexible scanning. Since the maximum reading distance of some laser scanners can be up to several meters, these devices are also very suitable for special environments, for example, warehouses with their high shelves. Charged Coupled Devices (CCD) sensors are comparatively inexpensive and work quickly. With up to 50cm the possible reading distance is very small and also depends on the size of the barcode. Only one-dimensional (1D), but not two-dimensional (2D) barcodes can be detected. 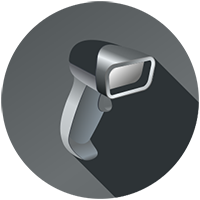 Barcode scanners with CCD technology are often referred to as "linear imagers", which occasionally leads to the false assumption that these devices are applicable for comprehensive imaging. However, over a plurality of LEDs arranged in rows, only a part of the full-width bar code is recorded as a digital image. Due to the low distance tolerance, but the high speed and accuracy, CCD technology is often used in bar code scanners for POS and other close-range scanning applications.